The Anterior Cruciate Ligament or ACL is a ligament in the knee that helps stabilize the knee during rotational activities. When a pivoting force occurs that is greater than the strength of the ACL a rupture occurs. Many times patients will report hearing a “pop” and experience swelling at the time of injury. How will we know this is your problem? 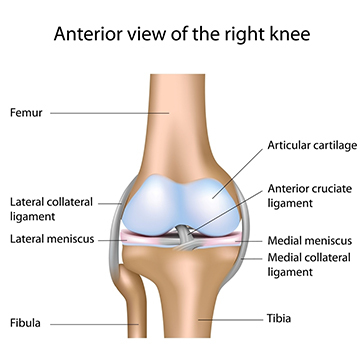 The diagnosis of an ACL tear is made based on your history of injury and physical examination. The knee is thoroughly examined and tested for instability. Radiographs and MRI also assist the physician in confirming the diagnosis and ruling out other conditions. How can this be treated? Initially the goal is to maintain the knee’s range of motion and decrease the swelling and pain in the knee. Physical therapy can achieve these goals as well as strengthen the muscles around the knee that help stabilize the knee. If you are not able to return to your prior level of activity with non-operative treatment and you wish to return to that level then a surgical reconstruction can be performed to reconstruct the ACL. There are many options for surgical reconstruction and these should be discussed with your surgeon, to choose the best option for you. These are the Doctors You Want! Dr. Mary Mulcahey and Dr. Wendell Heard practice at the Tulane Institute of Sports Medicine in New Orleans and at Tulane Lakeside Hospital for Women and Children in Metairie. They are fellowship-trained Orthopaedic Surgeons specializing in conditions such as ACL tears. The additional training they received in Sports Medicine surgery is considered to be among the best in the world.